Home / Editor's Choice, Entertainment News, Featured Articles, Gossip and Drama, News, Videos / This man keeps a tiger as a pet, he plays with it and even kisses it (VIDEO). 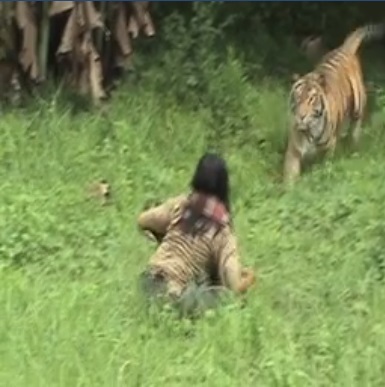 This man keeps a tiger as a pet, he plays with it and even kisses it (VIDEO). Wednesday, October 31, 2018 - Few people can get close to a tiger but for this man in Indonesia, he has kept a tiger as a pet since it was 3 months old. He plays with it, kisses it, feeds it and even sleeps with it. The man describes the tiger pet as his best friend. Hii dunia ina maneno kweli.